What experiment with the 40th St. Bridge? One woman in Millvale got so sick of the city, county and PennDOT pointing fingers at one another over sidewalk maintenance, she decided to take matters into her own hands. If you cross the upstream sidewalk, you will find her trash can. You can also donate to her expenses here. 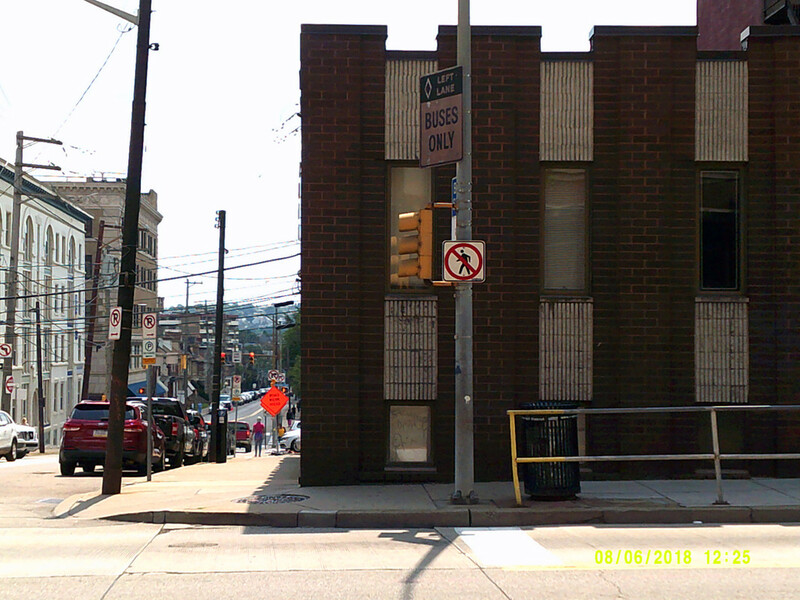 Forbes Ave. and Schenley Dr. Extension. 5th Ave. and University Pl. 5th Ave. at Darragh St./McKee Pl. 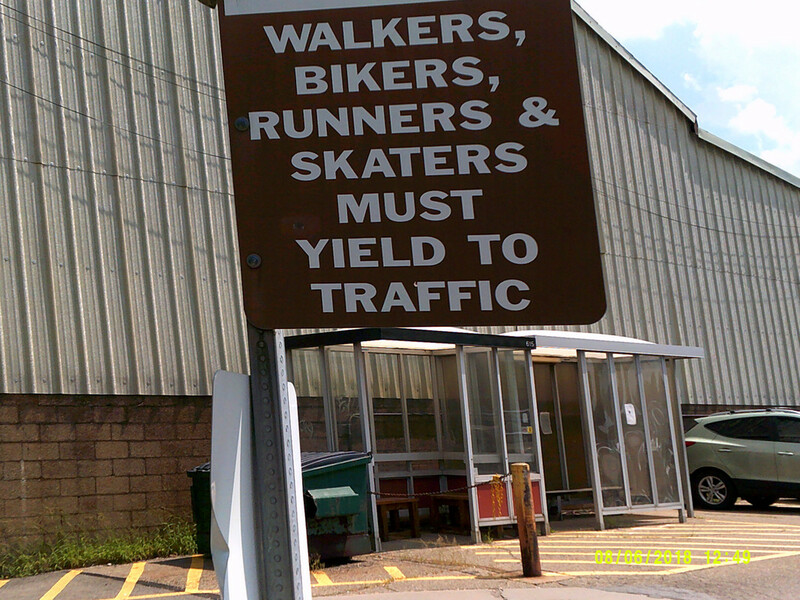 Sign by the Eliza Furnace Trail trailhead parking lot in Greenfield. I rechecked within the past week. The corner of Babcock and Siebert in Ross Twp still has “No pedestrian crossing” signs across all four directions, quite a feat for a T intersection. Why are there these signs in Oakland? The one at University Place seems obvious. All cars exiting University Place must turn right, so if pedestrians crossed from the west side of University Place, they’d be contending with such cars. On the other hand, if they walk across the street to the east side of University Place, they can cross without interacting with any cars. The situation at Darragh/McKee and Forbes/Schenley is similar. 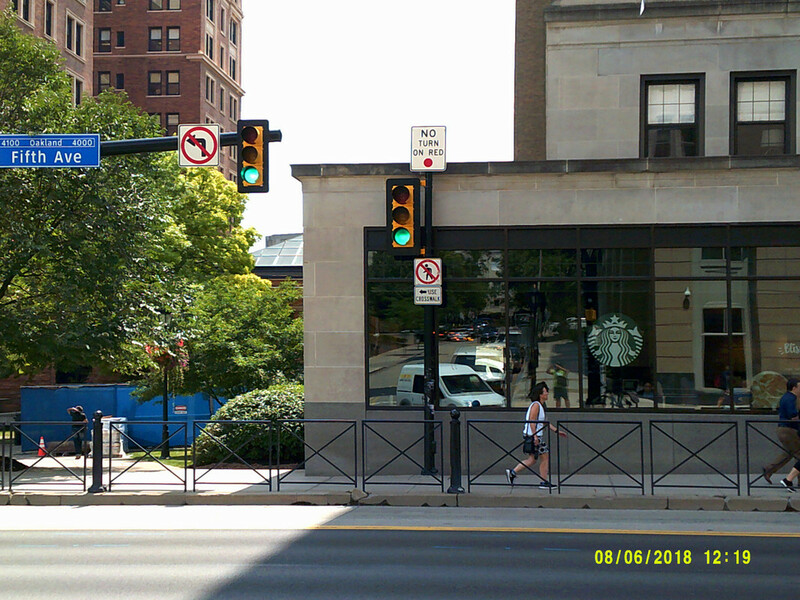 By placing a pedestrian crossing on only one side of the intersection, they can ensure that turning cars are never in contention with pedestrians crossing the wide one-way road. It’s an attempt to sacrifice some pedestrian convenience for safety. 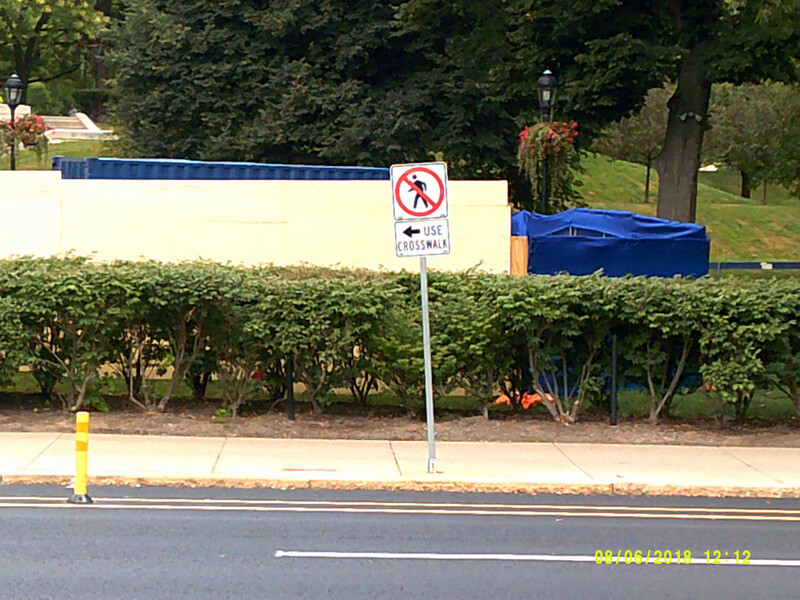 “No pedestrian crossing” signs all the way around. What are pedestrians supposed to do? Jaywalk mid-block? Why can’t pedestrians just cross on green like they would in Lawrenceville with its many traffic lights without pedestrian signals? I just noticed this intersection is along PA bike route V.
This reply was modified 4 months, 3 weeks ago by zzwergel.